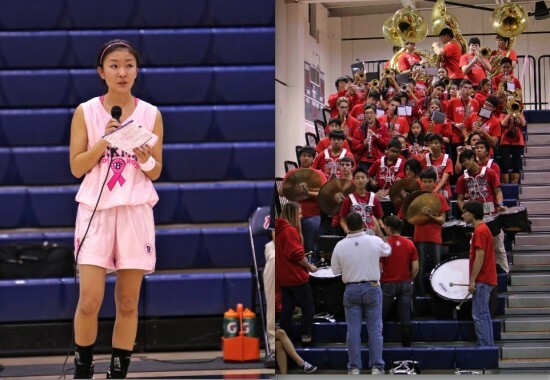 Left: Nina Fukuma, varsity basketball player, chaired the BHS vs. Northwood Pink Ribbon game. She is shown at the start of the game requesting that the audience support breast cancer survivors and help find a cure by donating to the Susan G. Komen Foundation. Right: The Beckman Marching Band, under the direction of BHS Music Director Jim Kollias, rallies the team during halftime. Band performers wore pink ribbons and pink face tattoos. Beckman High School’s girls’ varsity basketball team “thinking pink.” Back row from left: Alexis Casillas, Sydney Olivier, Holly Bard, Yeji Seo, Gabriela Jew, Brittany Burger, Lili Hamada, Kiara Quinn, Shawna McGanigal. Front row from left: Erica Chou, Janessa Paredes, Nina Fukuma, Jaleigh Belles, Jade Santos, Paulina Chung. 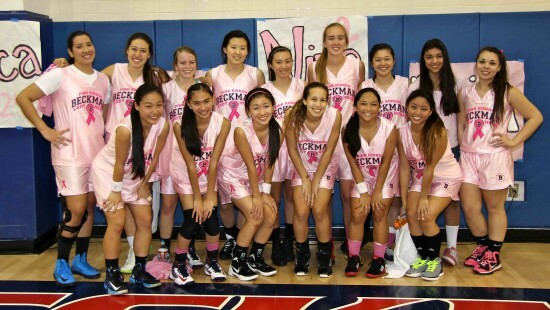 IRVINE — Beckman High School’s girls’ basketball team held a Pink Ribbon game on Jan. 18, when the Patriots hosted the Northwood Timberwolves. Varsity player Nina Fukuma chaired the event with Beckman Pink Ribbon Club representative Maham Usman. Baked goods and pink ribbon armbands were sold at a donation table. More than $200 was raised for Susan G. Komen for the Cure’s breast cancer research and education. Beckman, led by Alexis Casillas with 30 points, won the Pacific Coast League game, 50-35. 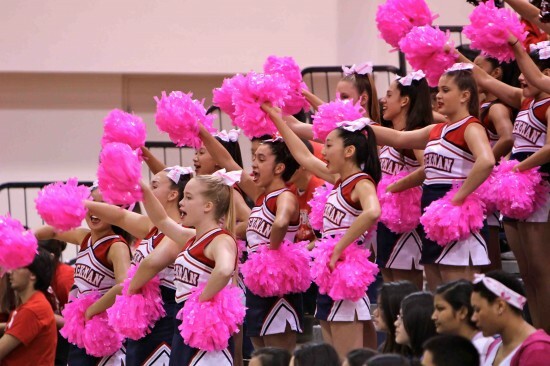 With pink pom-poms, Beckman Cheer gets in the spirit during a halftime performance.